Bright and Airy LEED Platinum School Commons in California Has No Walls! Designed as an experiment in sustainability and a model for future programs, this LEED Platinum school commons in California has absolutely no solid walls. Located north of San Francisco in a residential community called Ross, the breezy 7,550 square facility designed by Turnbull Griffin Haesloop Architects is situated in the center of Branson School’s campus and is fronted by an enviable terrace and garden where students enjoy nature-centered outdoor learning. 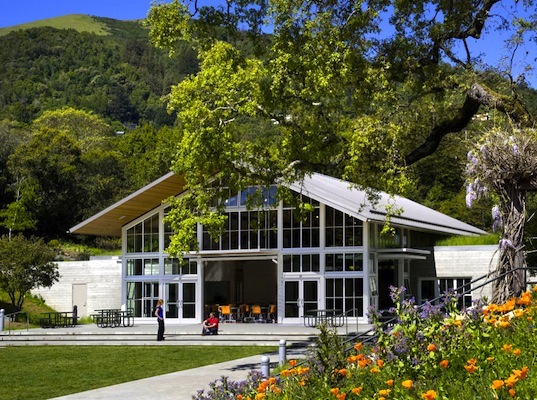 The entire gabled building is flanked by green-roofed supports that manage rainwater runoff and provide insulation, and benefitfrom its sunny southern exposure. Without doors to cut off air flow or sunlight, which is only possible because of the region’s mild climate, the students commons is both naturally lit and ventilated, which slashes its overall energy load. Rooftop photovoltaic panels capture solar energy and recycled concrete aggregate reinforces the school for concrete beams. A large and interactive LUCID screen documents the energy savings and other data resulting from this incredible project, and the information is being used in environmental science classes. In fact the whole project was a study in conscientious, sustainable design, and will continue to be used as a teaching tool for current and future (lucky!) students. Designed as an experiment in sustainability and a model for future programs, this LEED Platinum school commons in California has absolutely no solid walls. 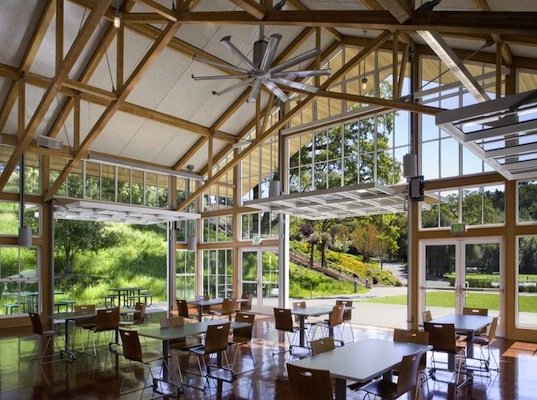 Located north of San Francisco in a residential community called Ross, the breezy 7,550 square facility designed by Turnbull Griffin Haesloop Architects is situated in the center of Branson School's campus and is fronted by an enviable terrace and garden where students enjoy nature-centered outdoor learning.